In April 2007, the TGV POS train, a French train operated by the French National Rail Company, set a new world speed record for travel on conventional rails. Between Meuse and ChampagneArdenne TGV stations, the train reached a speed of 574.8 km/h (357.2 mph). With an officially recorded top speed of 634.217 km/h (394.084 mph), the TOP 1 Ack Attack, a specially constructed landspeed record streamliner motorcycle powered by two Suzuki Hayabusa engines, boasts the title of the worlds fastest motorcycle. The world record of the fastest snowmobile is currently held by a vehicle known as the GForce1 made by Canadian GForce Division. In 2013, the snowmobile broke its former record of 210.8 mph (339.25 km/h) on the wide open salt flats at Bonnevilles landspeed shootout, reaching a top speed of 211.5 mph (340.38 km/h). On side note, they are planning to break the record again sometime in 2016. 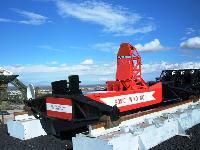 Designed for the purpose of breaking the land speed record for a dieselengined vehicle, the JCB Dieselmax was driven to 350.5 miles per hour (564 km/h) by Andy Green, a British Royal Air Force fighter pilot, in 2006. In 2010, Bugatti Veyron Super Sport, a sport car designed and developed in Germany by the Volkswagen Group and manufactured in France, reached a speed of 267.857 mph (431.074 km/h), creating a new speed world record for streetlegal production cars. Developed and operated by the Central Japan Railway Company, The L0 Series highspeed maglev train set a new land speed world record for rail vehicles of 603 km/h (375 mph) in April 2015. At the same time, it has become the fastest manned train in the world. In April 2003, an unnamed rocketpowered sled called Super Roadrunner became the fastest vehicle ever recorded on land, accelerating to Mach 8.5 and reaching a top speed of 6,416 mph (10,326 km/h) at the Holloman Air Force Base in New Mexico. 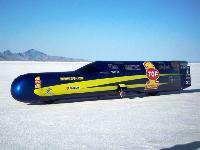 Ridden by John Stapp, a U.S. Air Force officer known as the fastest man on earth, rocket sled Sonic Wind No. 1 reached a speed of 1,017 k/h (632mph) in December 1954, claiming the title fastest unmanned rocket sled in the world. Not a traditional vehicle but still a vehicle worth including in the list, the fastest roller coaster in the world can be found at Ferrari World in Abu Dhabi, United Arab Emirates. Known as Formula Rossa, the roller coaster boasts a top speed of 240 km/h (150 mph). In September 2013, J.B Bowier, a Dutch cyclist, reached a speed of 133.78 km/h (83.13 mph) on a special recumbent bicycle named VeloX3. He achieved the speed over a 200 m (660 ft) stretch of road in Battle Mountain, Nevada, after a runup of 8 km (5 miles).